When people learn that I follow a primarily vegan diet, they say without fail, "I could never do that, it's too hard." But here's the thing: they totally could. That's why I love to share quick and easy Pure Vegetarian dishes that taste great and anyone can make without a ton of over-thinking and effort. Part of the fun of a Pure Vegetarian diet is experimenting and spending time in your kitchen coming up with awesome ways to make fab food minus the meat, dairy and other animal-derived ingredients; but there are many days when I'm just looking to make a fast meal — I figured there must be days when you are, too. 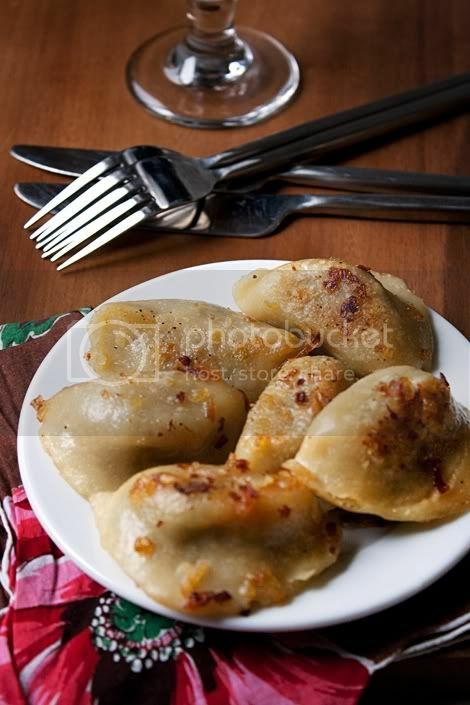 I sort of think of pierogi as Polish dumplings. And while they're not difficult to make from scratch, not everyone has the time to spend in their kitchen during the busy workweek to do it. Last week I found some spinach-and-potato-filled pierogi in my local Polish supermarket that started a spontaneous craving. I grabbed them along with an onion and some fresh garlic, and went home to start instant dinner. This pan-fried pierogi dish is basic and simple. It's not difficult to find pre-packaged gourmet pierogi (I'm not talkin' 'bout frozen Mrs. T's) in the refrigerated section of your supermarket or health food store. Read the labels carefully and choose pierogi that are filled with potato and vegetables — not cheese, unless you are Lacto-ovo and still working your way up to a fully vegan diet. To start: Bring a large pot of water to a boil and add all of the pierogi. Cook 4-5 minutes or until they float the top, drain and set aside. Cook the pierogi: Heat the olive oil and Earth Balance in a large non-stick skillet over medium heat, stirring with a wooden spoon until the buttery spread has melted. Add the onion and garlic, and let cook for a few minutes, stirring until the onion is translucent. Add the drained pierogi and season to taste with salt and pepper. Cook over high heat, turning the pierogi occasionally until the onion is soft and browned, and pierogies are nicely browned on all sides — the pierogi shells will get a little crunchy. Serve plain or with a dollop of vegan sour cream.